TWO 1/72 scale injected plastic construction model kits. 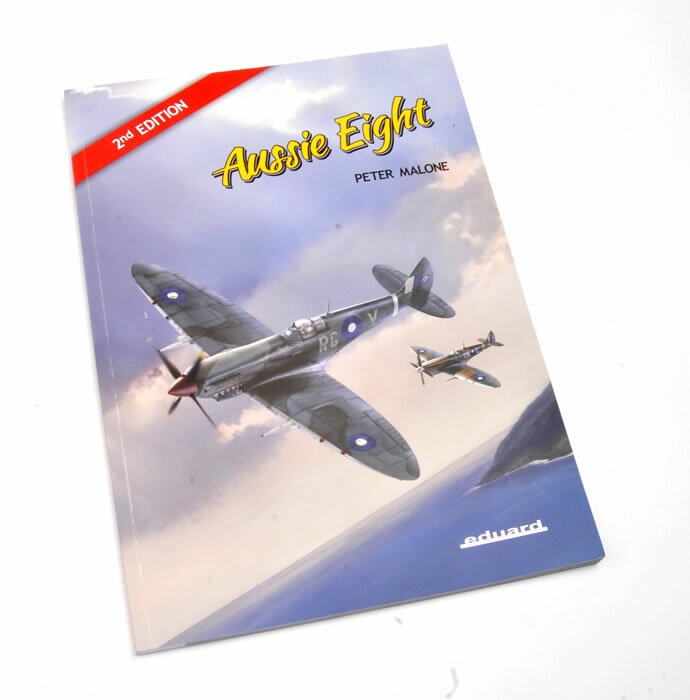 Eduard’s ‘Aussie Eight’ package is an essential purchase for anyone interested in modelling Spitfires, RAAF subjects, or both. Very highly recommended. 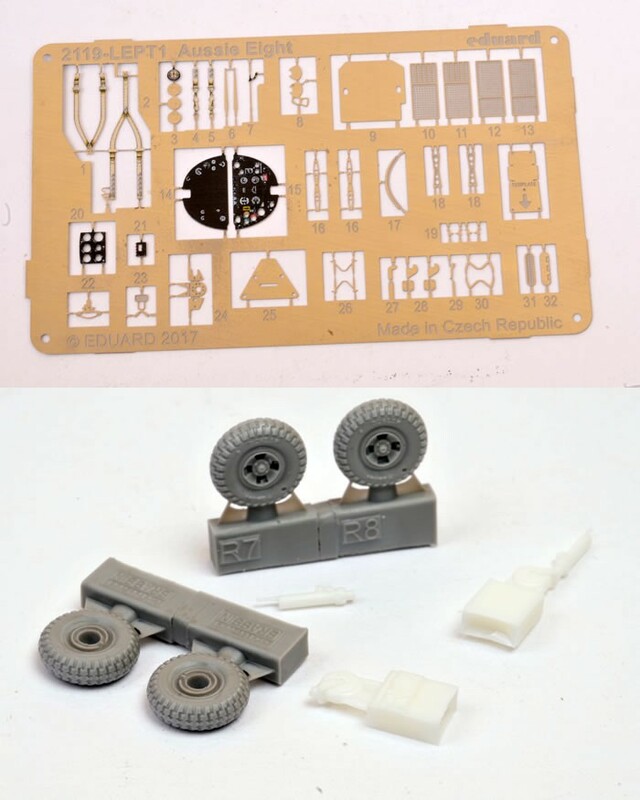 Two frets of photo-etched brass (one for each kit) containing painted and unpainted parts, mostly but not exclusively for the cockpit. A small sheet of pre-cut tape canopy masks, which will make this otherwise tricky painting exercise much easier. A 12-page black-and-white A4 instruction booklet. 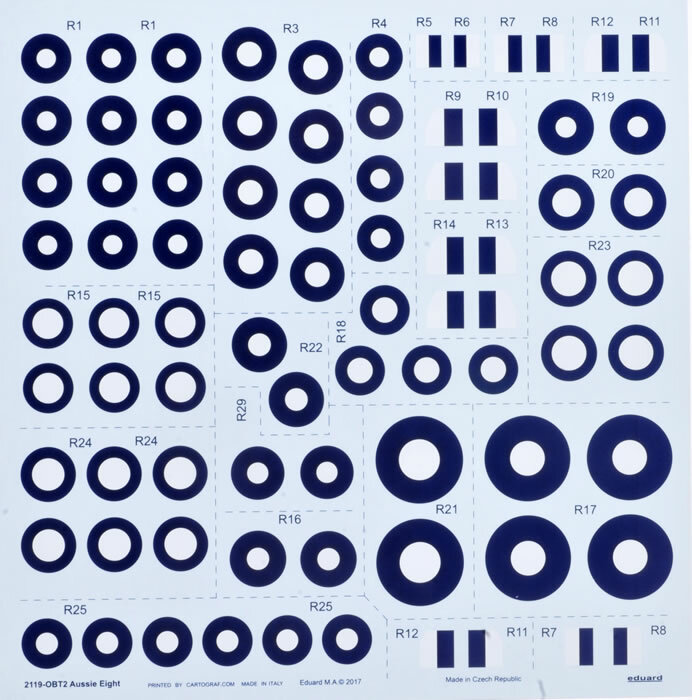 A 32-page full colour A4 painting and marking guide that provides four view illustrations of 32 schemes on 30 aircraft. 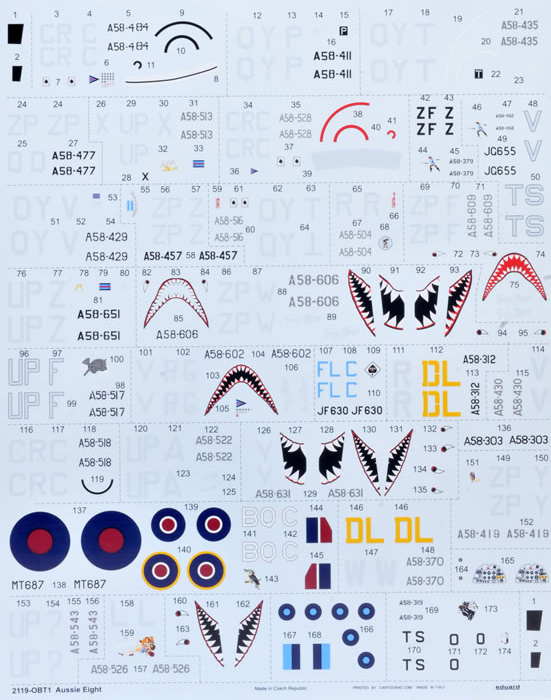 Two large Cartograf-produced decal sheets containing national insignia and individual aircraft codes and markings. 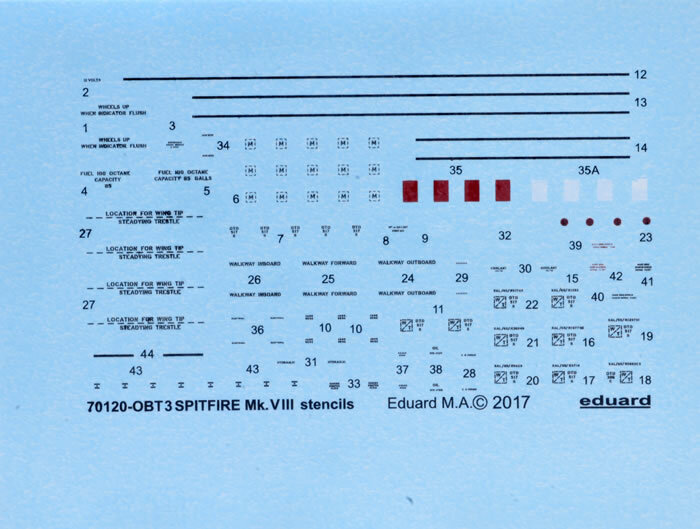 Two sheets of Spitfire Mk.VIII airframe stencils,. 104-page book ‘Aussie Eight’ by Peter Malone. 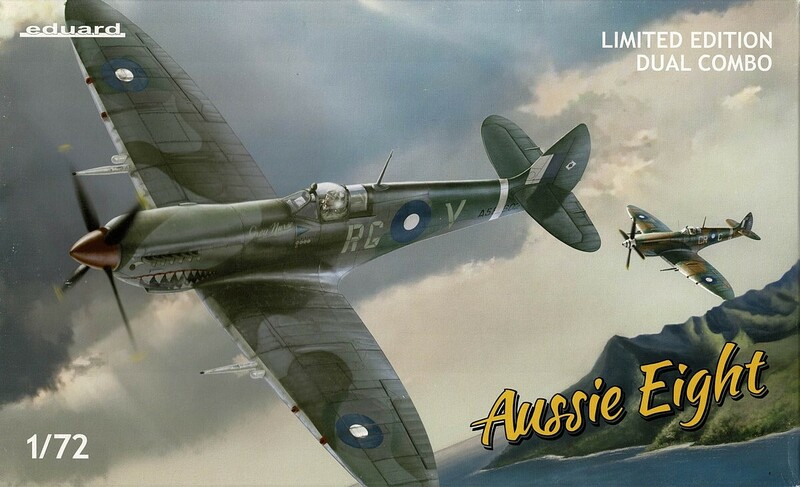 Chapter 1 – the RAAF and the Spitfire VIII. Chapter 2 – Camouflage and Markings. Chapter 3 – Spitfire Pilots. Chapter 4 – the Shootdowns. A58-484, CR-C, G/Cpt. Clive Caldwell, CO No.80 Wing, Morotai, Netherlands East Indies, March 1945. A58-411, QY-P, 'Betsy', F/O Peter Bullock, No.452 Squadron, Sattler Airstrip, Northern Territory, Australia, September 1944. A58-435, QY-T, F/Lt. William 'Ron' Cundy, No.452 Squadron, Sattler Airstrip, July 1944. A58-477, ZP-Q, F/O Alf Glendinning, No.457 Squadron, Sattler Airstrip, November 1944. A58-513, UP-X, 'A.V.B. The 1st', S/Ldr. Ron Susans, CO No.80 Wing, Morotai, June 1945. A58-528, CRC, G/Cpt. Clive Caldwell, CO No.80 Wing, Clark Field, Philippines, March 1945. A58-379, ZF-Z, F/Lt. David Glaser, No.549 Squadron RAF, Strauss Airstrip, Northern Territory, September 1944. A58-482, TS-V, S/Ldr. David Glaser, CO No.548 Squadron RAF, Darwin Civil Aerodrome, May 1945. A58-429, QY-V, 'Rima III', S/Ldr. Lou Spence, CO No.452 Squadron, Sattler Airstrip, late 1944. A58-457, ZP-Z, 'Sweet As A Song', S/Ldr. Tom Trimble, CO No.457 Squadron, Sattler Airstrip, late 1944. A58-516, QY-T, F/Lt. Des Cormack, No.452 Squadron, Morotai, December 1944. A58-504, QY-R, F/O Rex Watson, No.452 Squadron, Balikpapan, Borneo, August 1945. A58-609, ZP-F, 'Grey Nurse', F/Lt. Bill Cable, No.457 Squadron, Morotai, February 1945. A58-651, UP-Z, 'Judy III', S/Ldr. Ken James, CO No.79 Squadron, Morotai, May 1945. A58-606, ZP-W, 'Grey Nurse', S/Ldr. Bruce Watson, CO No.457 Squadron, Sattler Airstrip, January 1945. A58-606, ZP-W, S/Ldr. Bruce Watson, CO No.457 Squadron, Labuan, Borneo, August 1945. A58-517, UP-F, 'Hava-Go-Jo!! ', F/O Norm Turnbull, No.79 Squadron, Morotai, April 1945. A58-602, RG-V, 'Grey Nurse', W/Cdr. Bobby Gibbes, Wing Leader No.80 Wing, Sattler Airstrip, December 1944. JF630, FL-C, F/O Larry Cronin, No.81 Squadron, RAF, Palel, India, 6 March 1944. A58-312, DL-R, F/Lt. D.M. Gossland, No.54 Squadron, Truscott Airstrip, Western Australia, July 1944. A58-430, QY-V, F/O Jack King, No.452 Squadron, Tarakan, Borneo, July 1945. A58-518, CR-C, F/O Jack Pretty, No.452 Squadron, Morotai, December 1944. A58-522, UP-A, 'Hal-Far', F/Lt. Len Reid, No.79 Squadron, Morotai, March 1945. A58-631, ZP-V, 'Grey Nurse', F/Lt. George Scrimgeour, No.457 Squadron, Labuan, Borneo, June 1945. A58-303 of No.1 APU, Laverton, Victoria, Australia, late 1944. A58-370, DL-W, No.54 Squadron RAF, Darwin Civil Aerodrome, May 1945. MT687, BQ-C, No.451 Squadron, Cuers airfield, France, September 1944. A58-526, UP-L, 'Avagrog', No.79 Squadron, Morotai, May 1945. A58-543, UP-?, Warrant Officer Hubert Eccleston, No. 79 Squadron, Morotai, May 1945. A58-419, ZP-Y, 'Blondie', F/O Fred Inger, No.457 Squadron, Sattler Airstrip, October 1944. A58-602, RG-V, 'Grey Nurse', W/Cdr. Bobby Gibbes, CO No.80 Wing, Morotai, April 1945. A58-319 "Oily", F, Sgt Robert Ingles Buchan, 548 Squadron RAF Darwin Civil Strip, November 1944. All this makes for a heavy parcel. 1.5KG.